Get ready for the April Drools Dog Brunch - a doggy brunch and get-together, raising funds for Staffordshire Bull Terrier Rescue and Cinque Ports Rescue on 6th April! Get ready for the April Drools Dog Brunch – a doggy brunch and get-together, raising funds for Staffordshire Bull Terrier Rescue and Cinque Ports Rescue on 6th April! 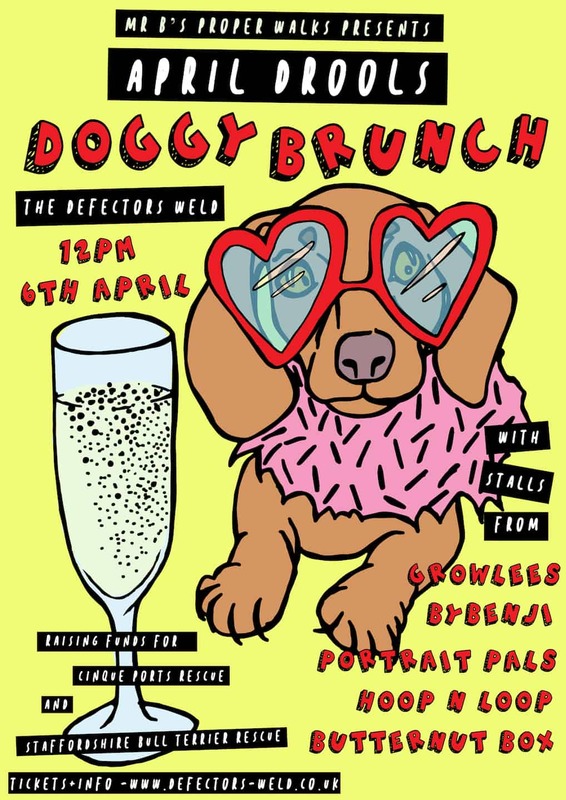 Dogs (and humans) are invited to join Mr B’s Proper Walks for Brunch and lots of fun at The Defectors Weld 12-5pm! Come get that ‘hair of the dog’ after your Friday night out or just brunch out after a long week at work with something tasty on the menu… dogs, don’t worry, there will be something on there for you too! Plus stalls from Growlees, Portrait Pals, Hoop n Loop, ByBenji, Butternut Box, a Raffle and an Easter Edition of ‘Where’s Wilbur?’ Make sure you get your paws on a ticket! Included for the Hoomans there will be a selection of breakfast, brunch and lunch dishes to choose from. £22 gets you 3 dishes and a virgin cocktail! £32 gets you the same but with bottomless prosecco! Ticket prices include a donation to our featured charities Cinque Ports Rescue and Staffordshire Bull Terrier Rescue – you will be able to find out about some of their dogs looking for homes and hear more about the proper amazing work they are doing for rescue dogs across the UK! Tickets are available here. April Drools Dog Brunch – Where’s Wilbur? Loveable staffie Wilbur has teamed up with the Easter Bunny and will be hiding eggs (and himself) around the pub, see how many you can spot on the day to take home a treat!